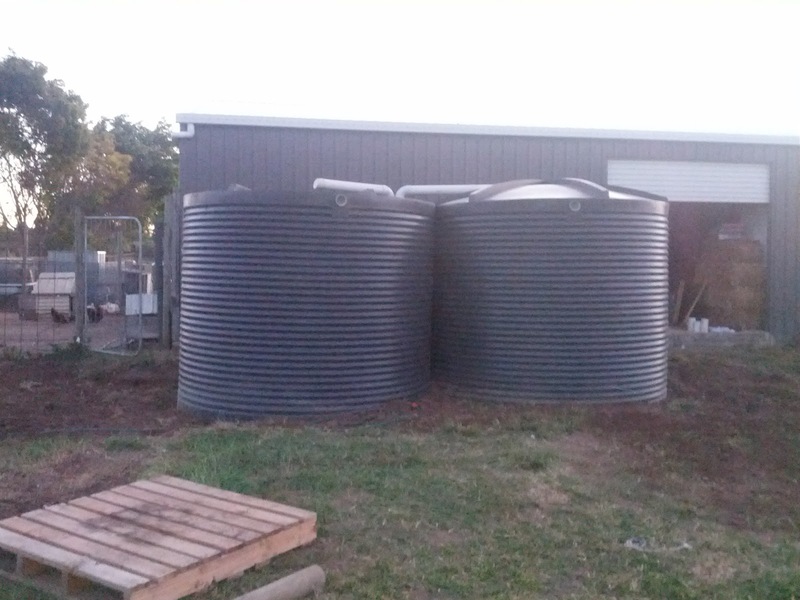 Well this weekend the tanks were moved and reconnected, apparently just in time as Sunday evening saw the return of the of rain, with more forecast this week. 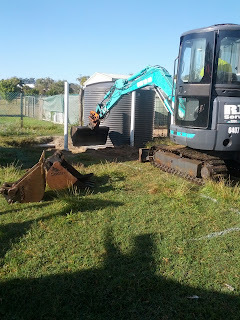 Friday morning 8 am Deon arrived with the excavator, taking a little over 2 hours to clear the area and move the tanks in position. Well we did end up pulling them back away from the shed with the car (as they were a little too close). 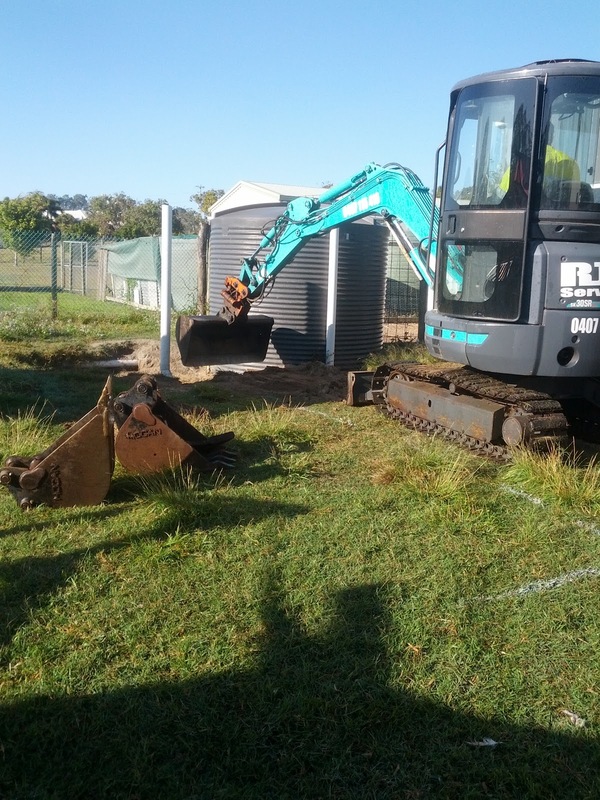 And Matt rolled the empty one out again and climbed inside in an attempt to pop the top back out- as the excavator had pushed it in. (Some thing that’s been annoying him ever since). 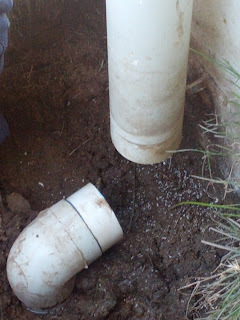 We also asked that he scrape back the area carefully as the stormwater and house connections run underneath. All of which we would need to reconnect the tanks following his departure. These he did not find, even though he had cleared the area along side the shed to the depth the tanks were then submerged. So once the excavator and driver had left Matt began digging back along the pipes by hand. It was really surprising how deep they went! I’m afraid Matt did most of the work alone on Friday. My contributions of supervising, documenting and generally getting in the way, mostly just irritated him. My lack of assistance was not an aversion of manual labour, but that I have spent much of the weekend suffering from a cough and cold. 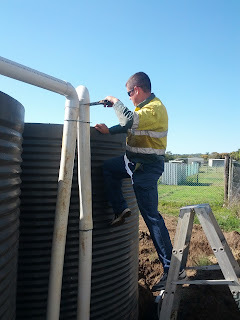 I did manage to pass him bits and pieces in the afternoon, as he ran up and down the ladder realigning and gluing the PVC down piping in place. 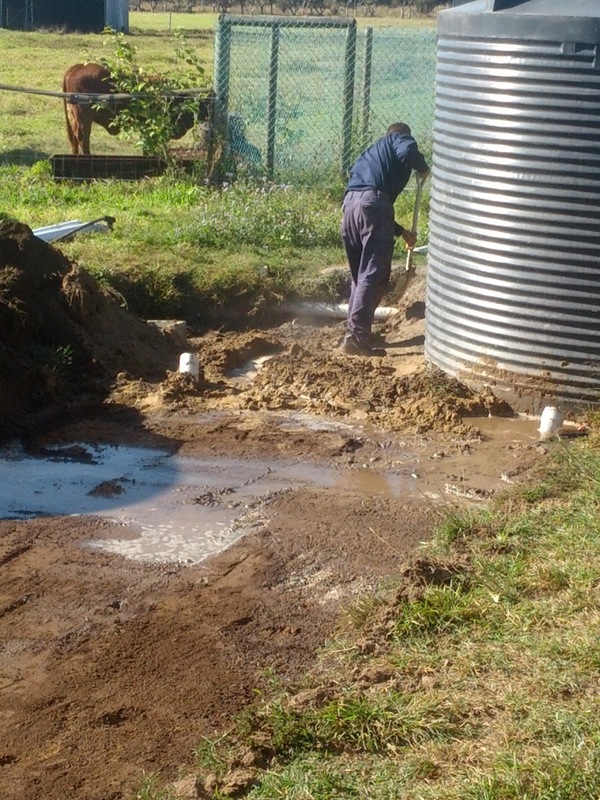 Reconnecting the pipe work that leads to the pump (and therefore the house). This went on until dark (which in the tropics was probably 7pm), but meant working under work lights, which didn’t make the job easier. 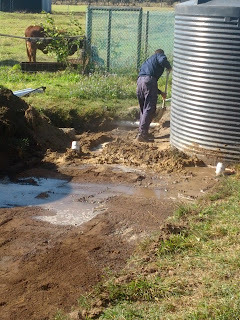 I did perk up a bit Saturday, and I helped test the reconnected pipe work (now that the PVC cement had, had time to cure). 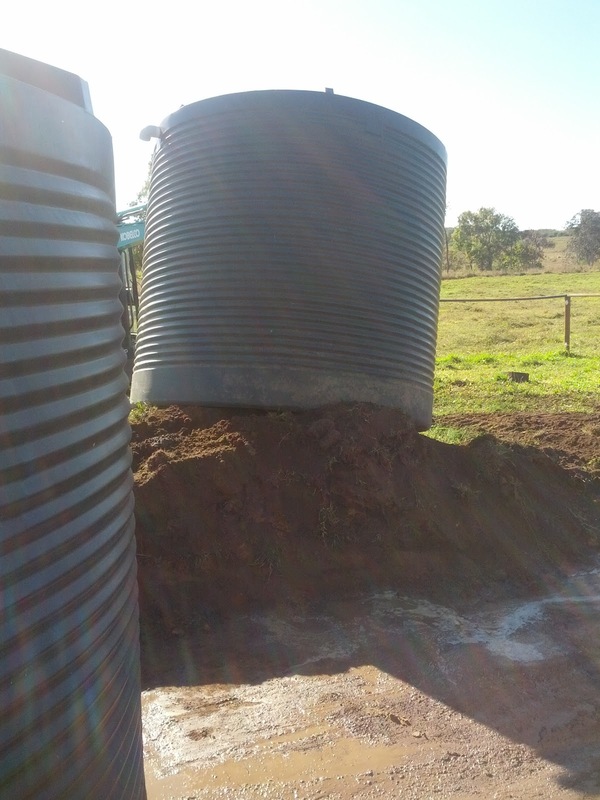 This involved running hose pipe to the gutters and flooding them until water run through to the tanks… This didn’t exactly go to plan. We discovered that the pipes at the front of the house filled the one tank and the back fill the other. This may seem in consequential, but the downpipes at the front are lower than those at the back. Therefore the outlet supplying the tank also needs to be lower, as water finds its own level. And if the tank outlet is too high (which at the moment it still appears to be- by centimeters) the water will drip/ flow over the downpipe and not into the tank. It also seemed strange when nothing was flowing from the back of the house- especially as the downpipes were much higher. 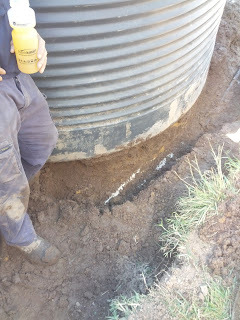 Matt then uncovered s leak in the downpipe at the corner of the house, a few meters off the patio. A patch that has often been damp during the wet season, but as it’s a bit of a dip, we had not really paid it much attention since we moved in. But a meter or more down was a cracked elbow joint! So the water had not been reaching the tank. So another trip to the DIY store and more PVC cement. 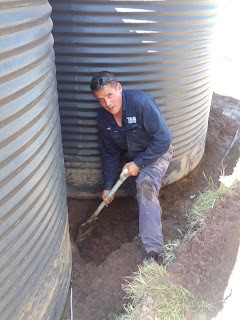 Saturday afternoon was all hands on deck to shovel the remaining soil back around the tanks. Matt did admit toward the end of the day, that I was beginning to fade quickly (and didn’t want to be accused of making me work when I was sick. But finishing the job took us half and hour, although he had offered to finish the last few barrows alone- I did feel rather guilty for abandoning him the day before. And I’m sure my Nan used to swear by sweating out a cold (or something like that). Though once we were done I had a shower and went straight to bed for about 2 hours. 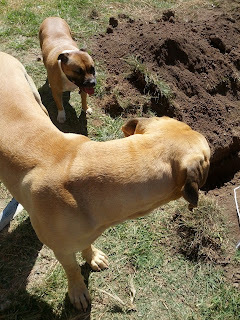 Sunday we reconfigured the connections to the water pump. 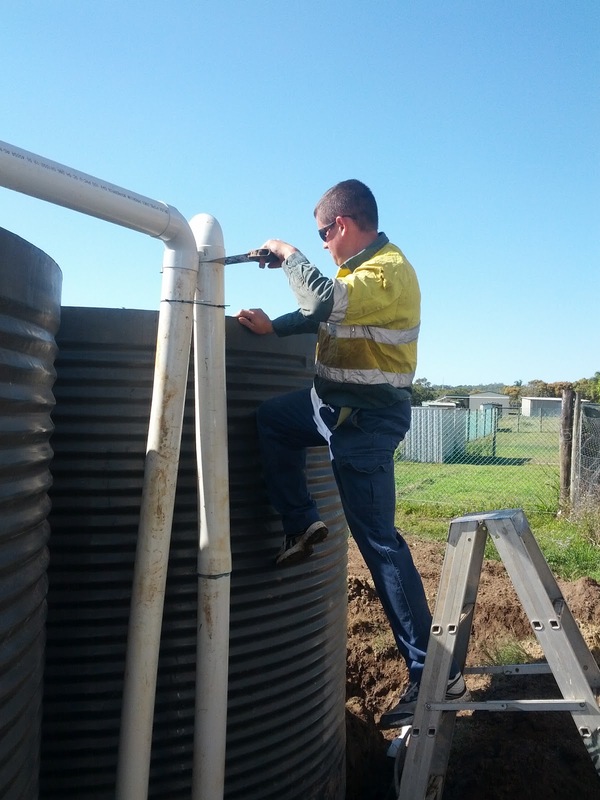 Incorporating taps, that should allow for the tanks to be operated without the need to disconnect or connect pipe work. In other words, if Matt’s not here I could do this easily without struggling or having leaks. As some of the connections and seals are quick tricky. I also don’t think taking them on and off all the time is really any good for their lifespan. 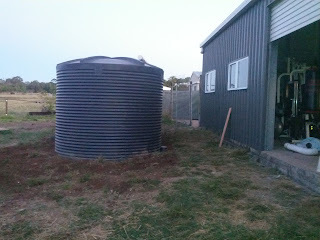 So the tanks are in, all reconnected and we had begun running the bore into the tanks to test them… but then came the real test. It does look as if we’ll need to drop the outlet level of the one tank a few more centimeters, as the water is sitting in the outlet and then backing up at the downpipe. But it’s pretty close. 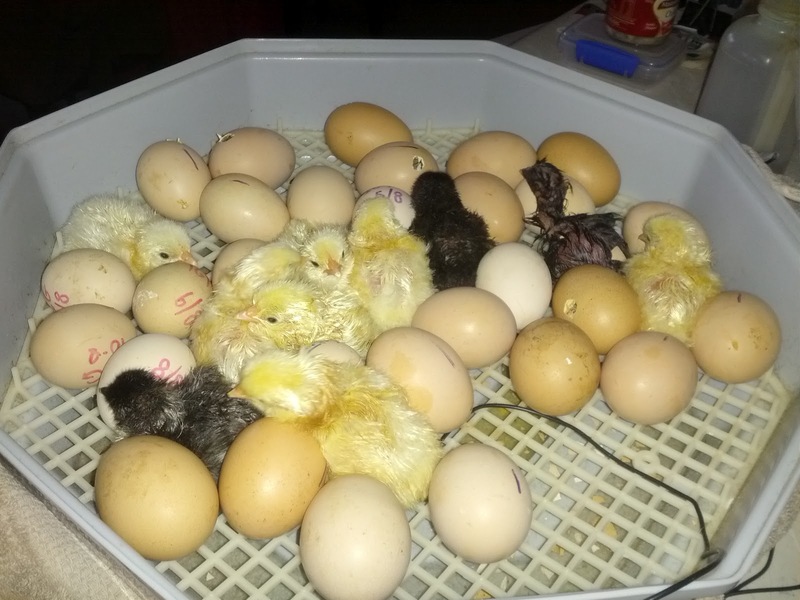 Otherwise this weekend I sold my first dozen “fertilised eggs” to a colleague of a lady I have sold chicks to in the past (and who we bought Madog from). As they have a few broody hens. They said they would let us know how they go, as we haven’t hatched chicks out from under a chicken. I have often wondered how people sell fertilised eggs. As how can they guarantee thy are fertilised. I know we have a working rooster (we have some hatching in the incubator right now). And the eggs were fresh, they were collected that morning and the ay before. So I hope they have some success with them. As I just said we have a few hatching at the moment. 2 arrived Saturday, 3 more Sunday and I woke to 9 this morning, with at least half a dozen more “pipped”. Sunday has been a poultry day all round.